I spent most of my dating years not knowing what I really wanted or deserved. What I daydreamed about I wasn’t even sure existed. I was constantly waiting for some hero to show up. As I have matured and grown in wisdom and experience, I have found that the gentleman is on the other end of my respect. Both the respect I have for myself and for him. This does not mean it’s universal, or always the case. There are plain and simply some bad apples. When I asked myself what do I desire from a man? I also asked what do I offer him? The pic above is for humor, but seriously Prince Charming probably won’t show up in his final form, all spiffed and polished…but neither does Cinderella. When you find yourself daydreaming about the man you wish you could find, have you ever stopped to think about who you are, what you are offering? Do you always show up ready for the ball? Or are you sometimes tainted with soot and rags? Love takes us as we are, but it does not mean we stay that way. True love buffs and polishes. Our friction in relationships can sometimes be a part of the cleansing process, in the end creating a beautiful shine. It helps to realize that sometimes we receive healing, while sometimes we are the healer. Sometimes we lead, sometimes we follow. Sometimes we hide, sometimes we seek. Sometimes we are rescued, sometimes we are the rescuer. You can have a fairy tale, a happy ending; just don’t expect to walk right into the finished product. Sometimes you need to journey together to arrive at the end you both desire. It helps to know yourself and what you want, and want to give. Give the respect you want to receive, the love you desire. Choose your words wisely. Make requests not demands, understanding not condemnation, invitations not ultimatums, respect not rebuke. Many men have been demoralized, emasculated, and disenfranchised in our modern world. If you want a good man, help to bring the best out in him. Likewise, a man needs to love and guard a woman’s heart to bring out the best in her. 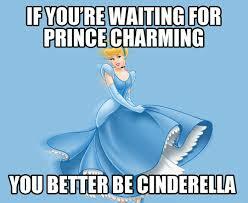 Men cannot expect to demean and degrade women yet still find their Cinderella. Our actions produce reactions. What kind do you want out of your mate? I completely agree! Perfectly written. very well written… you just put my thoughts into your words…. Reblogged this on cumminsgirl: the journey of a submissive woman.